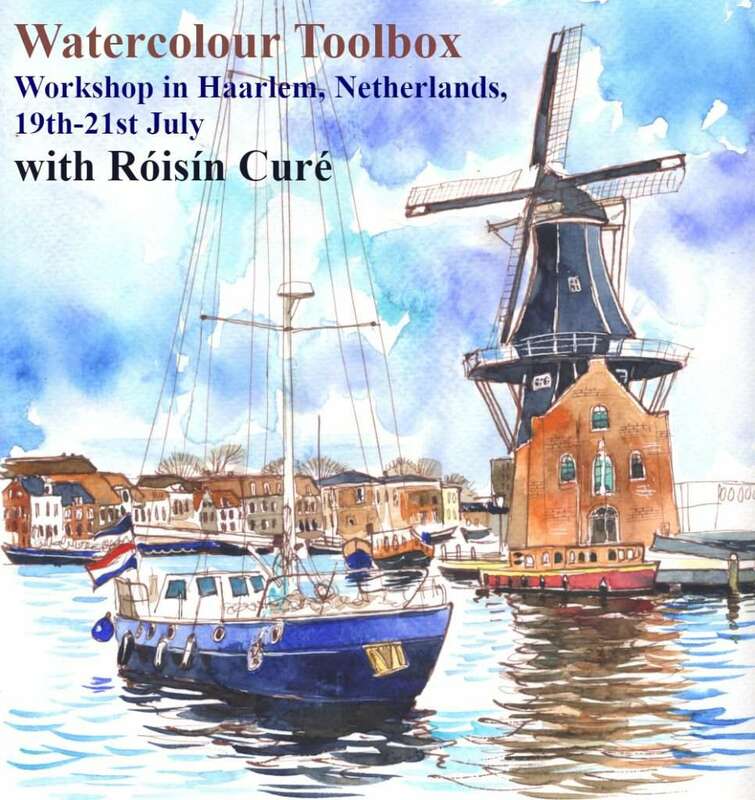 Join me in Haarlem this summer for a three-day watercolour sketching workshop. 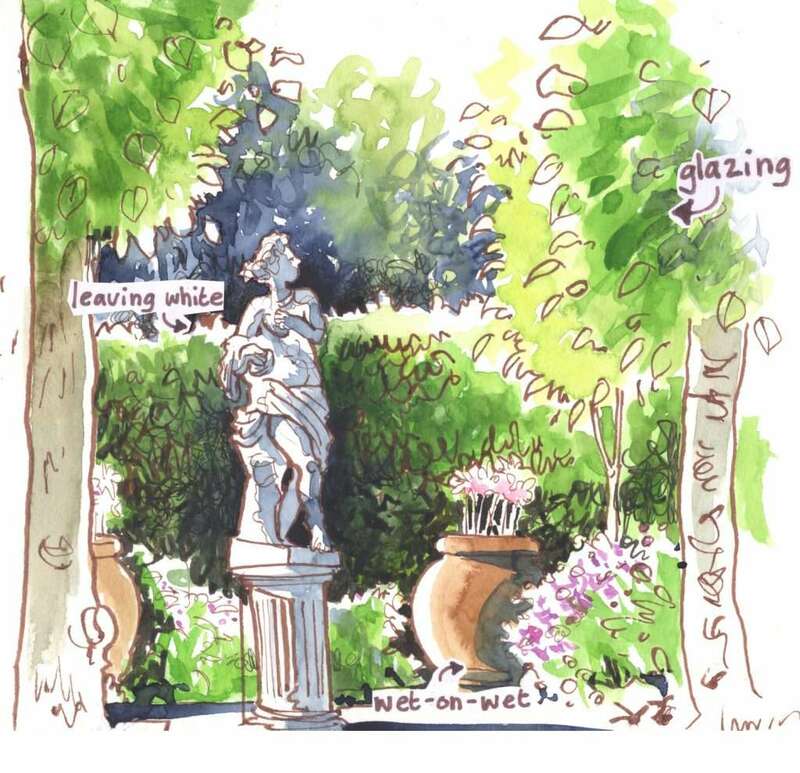 Learn to make watercolour behave – and then give it free rein to express itself! I’ll teach you straightforward techniques to ensure a satisfying result in your sketches. Then you can attend USk Amsterdam with new confidence, or just join in the atmosphere, flexing your watercolour prowess along canals and before those gorgeous gable-fronted buildings. Haarlem is often called “Little Amsterdam” – smaller and less busy, but every bit as pretty as its bigger neighbour. Only 20km from Amsterdam, at just 18 minutes away by train, you can easily travel between the two. By the end of the three days I hope to leave you feeling much more confident in your watercolour skills. I would like you to feel that no matter what the sketching situation, you know you can make it spring into life with the confident use of colour. Day 1: The basics of watercolour. How much water? How more or less water controls intensity. Values in watercolour: warm and cool colours. Reflections. Making a watercolour sketch using just a few colours, your choice of dark blue (or blue-grey) and a small selection of browns. Day 2: Glazing and transparency. Leaving the white of the page. Using white as a means to make your sketches glow. Highlights and making colour pop. Putting it into practice: using white and glazing to make fresh, lively foliage. Making your subjects pop using glazing and intensifying colour. Day 3: Getting the most out of wet-on-wet. 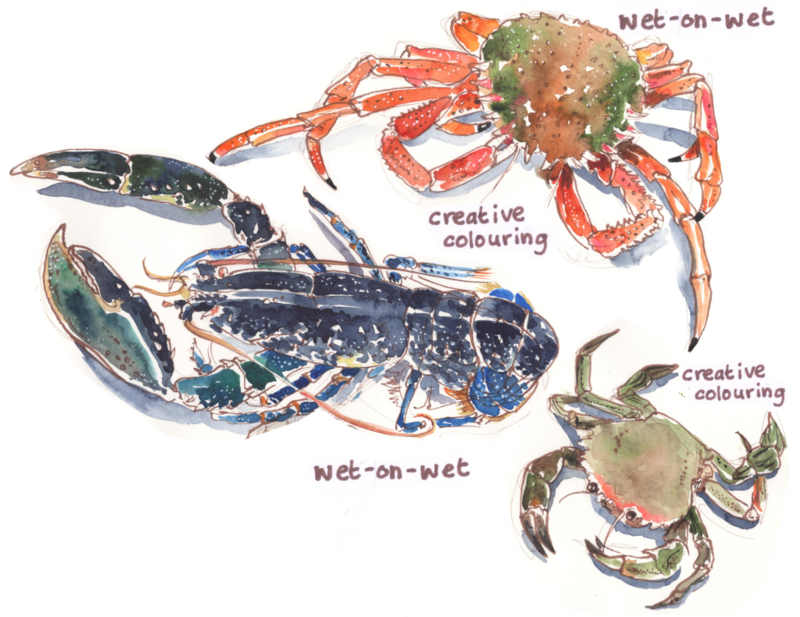 The true beauty of watercolour – walking the line between control and lack of control! Creative colouring techniques. Making a rich, smooth sky, making clouds of any type and using wet techniques for a smooth finish. Foliage becomes easy with a little know-how. 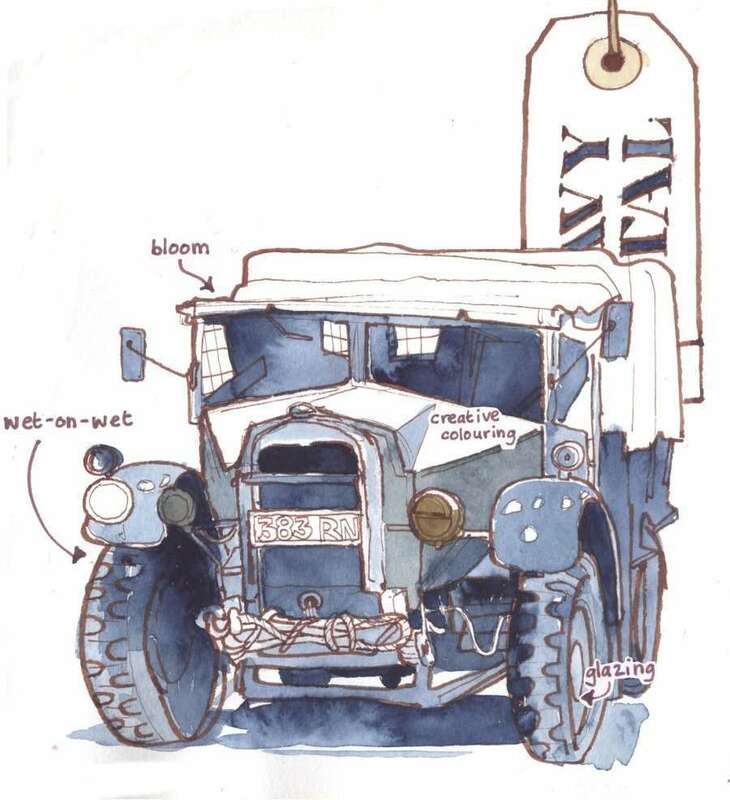 You will need to bring a sketchbook with good-quality paper, in the region of 200g or more in weight. My current favourite is the Watercolour Book by Hahnemuhle. It comes in lots of different sizes – just pick the one you feel most comfortable with. I use an A4 landscape format for panoramic sketches (over two pages that’s a lot of space!) but I love the A5 portrait format as it’s small and convenient. I usually have about 14 colours in my paintbox. I use half pans in a travel set. My current set is a Rembrandt box with Daniel Smith, Rembrandt and Schmincke colours in it. Bring your favourite. When you sign up I will send you my list of favourite colours. I like a decent travel brush or two, in a size 8 and a size 12. I am using Escoda Versatil and Rosemary brushes at the moment. A waterbrush is great for sketching on the go but two are better than one, so that you don’t have to squeeze too hard to change colour. Bring your favourite drawing tool: I use a fountain pen with waterproof ink but the course is about watercolour rather than drawing, so feel free to bring your drawing implement of choice. My current (and longtime) favourite is my fude pen by Sailor (the green one) and my favourite ink is De Atramentis Document ink. Brown is great as it’s soft. I would hate to forget my clips when I’m out and about. Better yet are magnetic clips that you can attach your paintbox to. You’ll need a portable stool. I use a stainless steel pot for water – it’s sold as a “stainless steel paintbrush washer”. It’s light, leakproof, strong and sturdy. But plastic is fine. You don’t need me to remind you not to forget to think about clothing – layers if it’s changeable, hat if it’s sunny, suncream if it’s very sunny. The maximum number for this workshop is 12. You will be in charge of all travel arrangements, meals and accommodation. There is a map below showing the area and some accommodation available through booking.com. Registration is €320 per person. Often it’s as simple as not applying enough paint. To book your place please fill in the booking form below, consent to the terms and conditions and pay. you can express its true nature with some creative colouring techniques. (1) Places in the workshop are strictly limited to 12. This does not include companions, whom we will do our best to accommodate. (2) This workshop is based on a minimum of 7 people attending. (3) The workshop will be conducted in English. French and Spanish translation is available from Róisín upon request on the day. (4) The workshop will take place between 9 am on Friday 19th July and 4.00 pm on Sunday 21st July 2019. (5) It is the responsibility for the attendees and their companions to make their own way to the location in Haarlem, Holland on the first day and to the various starting points each morning in good time and to arrange their own departure after the workshop ends. (6) Please arrange your own insurance. You should arrange to insure against problems in all aspects of your travel, including flight cancellation, health problems, baggage loss or damage, or cancellation of the group tour booking. (7) We can suggest some places to stay, but we will not be held responsible for any deficiencies in that accommodation. (8) The itinerary may be adjusted to accommodate unforseen changes to the schedule. (9) The weather may dictate that we have to work indoors. If this is the case, then suitable adjustments to the programme will be made, so that the workshop can continue. (10) We do not provide any art materials to the participants as standard. Please bring these with you. We will list the items we think you should bring. If you wish us to source some art materials for you, then we can do this, at your own expense. Please contact us if you want us to get anything for you. (11) We will not be held responsible for theft or damage caused by others during the workshop. Please ensure you are covered by insurance for these eventualities. (12) We cannot be held responsible for events beyond our control, such as floods, power cuts, storm damage, water shortages, drinking water contamination, leaks etc. We will try to help if we can to resolve any issues that arise. (13) The workshop fee only covers the tuition fee. All other costs are at the participants expense. (14) Róisín Curé Art reserves the right to change the location in the case of force majeure. The customer shall inform Róisín Curé Art in writing whether he or she chooses to withdraw or to benefit from the alternate package within and not after 2 days from receipt of the alternate proposal. Should the customer fail to accept any variations, Róisín Curé Art shall return only the sums of money received within 7 working days from receipt of the communication from the customer. (15) Damage and Charges. Attendees and their companions are required to act in a responsible manner at all times. Róisín Curé Art reserves the right to recover from clients the cost of any loss or damage caused by a failure to respect the property, fixtures, or fittings in the sketching locations. (16) We cannot be held responsible for force majeure including (but are not limited to) strikes, breakdowns, illness, accidents, volcanic dust clouds, storms, war, terrorist acts, riots, floods, etc.